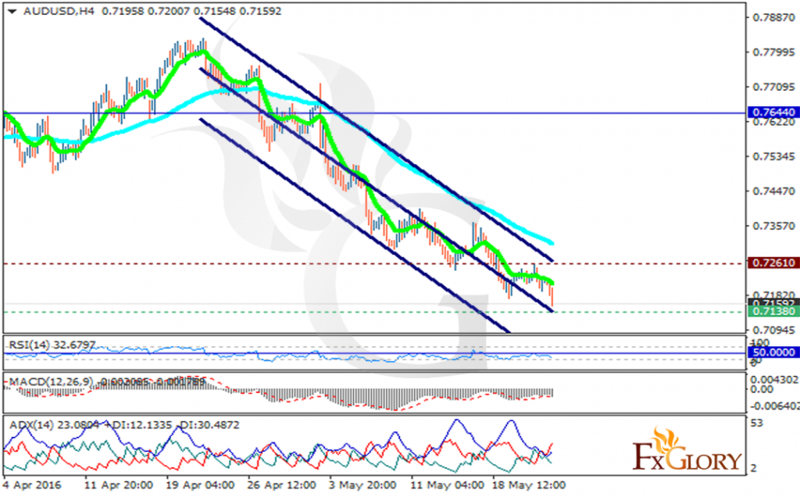 AUDUSD tried to move in bullish bias on 19th of May but bears took the control of the chart on 23rd of May and continued the long term bearish pattern. This pair is moving in lower ranges finding support at 0.71380 with resistance at 0.72610 which both lines are below the monthly pivot point at 0.7644. All indicators are showing price decline, the MACD indicator is in negative territory, the RSI is below the 50 level and ADX is showing strong sellers. The EMA of 10 is located below the EMA of 75 confirming the price fall over the last recent days. The price is getting closer to the support level and the support level breakthrough will smooth the way for further decline. Considering this scenario, short positions are recommended.